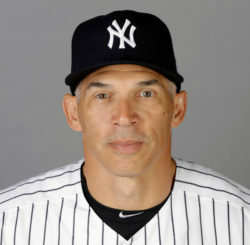 In 10 seasons as the Yankees’ manager, Joe Girardi guided New York to six Postseason appearances and a World Series Championship in 2009. Girardi managed the Florida Marlins in 2006, winning the NL Manager of the Year Award in his managerial debut. Born in Peoria, Illinois, Chicagoland native Girardi attended college at Northwestern University in Evanston. He played for the Northwestern Wildcats baseball team and earned All-America distinction, capturing third-team honors in 1985. Girardi, a three-time All Big-Ten catcher and three-time Academic All-American is among NU’s all-time career leaders in many offensive categories. Girardi began his 15-year catching career with the Chicago Cubs (1989-92 and 2000-02) before joining the Colorado Rockies (1993-95), Yankees (1996-99) and St. Louis Cardinals (2003). With the Yankees, Girardi caught Dwight Gooden’s no-hitter against the Seattle Mariners on May 14, 1996 and David Cone’s perfect game against the Montreal Expos on July 18, 1999. Girardi was named to the All-Star team in 2000. Prior to his managerial career, Girardi was part of ESPN Radio’s coverage of the 2003 NL Division Series, later serving as an analyst with the YES Network in 2004 and 2007, and worked with FOX Sports throughout the 2007 regular season and Postseason. Joe Girardi, the 11-year Major League manager, is currently a studio analyst appearing across MLB Network’s programming, including the Emmy Award-winning flagship studio show MLB Tonight. Girardi joined MLB Network in February 2018. Joe resides between New York and Florida with his wife, three children and two dogs. Joe Girardi was inducted into the National Italian American Sports Hall of Fame in 2018.